Copyright: © 2016 Duerr PJ, et al. This is an open-access article distributed under the terms of the Creative Commons Attribution License, which permits unrestricted use, distribution, and reproduction in any medium, provided the original author and source are credited. The Krebs (or tricarboxylic acid, TCA) cycle forms a central junction in aerobic metabolism, being connectedto glycolysis, gluconeogenesis, fatty acid metabolism and amino acid metabolism (Figure 1). Pyruvate carboxylase (PC) catalyzes the carboxylation of pyruvate to form oxaloacetate, an important so-called anaplerotic reaction to provide a sufficient level of metabolites for the TCA cycle. The breakdown of oxaloacetate to pyruvate by oxaloacetate decarboxylases (ODx) is mainly known from prokaryotic organisms where two main variants of ODx enzymes are known: a membrane-bound variant that depends on sodium and biotin  and a soluble variant that depends on divalent cations . Far less is known about ODx activity in mammalian organisms, apart from the promiscuous activity of some metabolic enzymes . 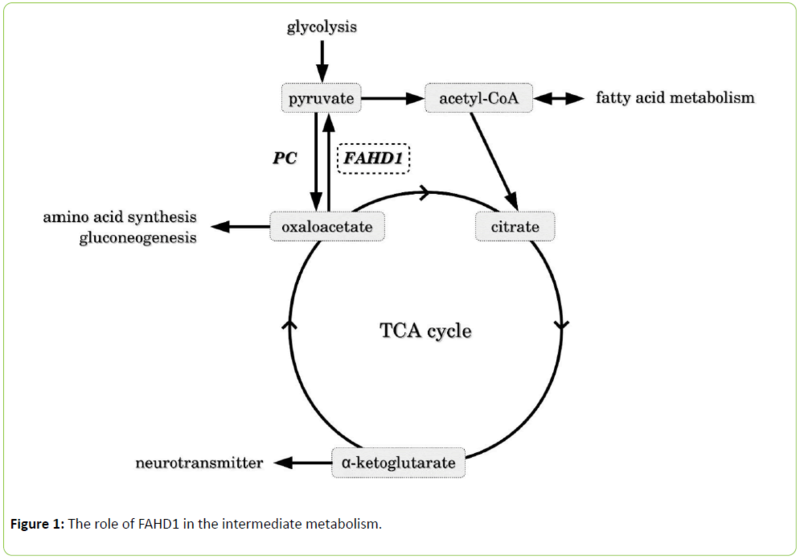 Figure 1: The role of FAHD1 in the intermediate metabolism. 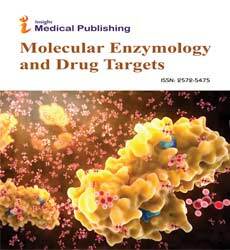 Many decades ago several reports about an ODx enzyme purified from extracts of rat liver mitochondria surfaced [4,3], but curiously enough the identity of such an enzyme was never clarified. Until recently, members of the FAH family of enzymes were not known to be connected to the TCA cycle in any way. The eponymous FAH enzyme acts as a fumarylacetoacetate hydrolase, catalyzing the final step of the tyrosine breakdown . Loss of this function causes hereditary tyrosinemia type I (HTI) in humans . The prokaryotic realm provides a perplexingly large number of FAH type enzymes which, in spite of the structural similarity of their catalytic domains, collectively referred to as the FAH fold, catalyze a wide range of reactions . They comprise hydrolases, isomerases, decarboxylases, hydratases and dehydratases, demonstrating the versatility of the FAH fold. Besides FAH itself, the only other members of the FAH superfamily present in mammalian organisms are FAHD1 (fumarylacetoacetate hydrolase domain containing protein 1) and FAHD2. Classification of their function has proven difficult due to the aforementioned spectrum of FAH fold activities. In a first study, the comparison of FAHD1's primary sequence with prokaryotic members of the FAH family led to the observation that FAHD1 exhibits acylpyruvate hydrolase activity . This activity is so far not associated with mammalian metabolism, however. In a recent study to further investigate the cellular role of FAHD1, molecular modeling was applied to search for a close structural match between the catalytic domain of FAHD1 and other members of the FAH family . This process yielded the prokaryotic enzyme Cg1458 as a promising candidate, previously identified as a soluble ODx .Subsequent in vitro analysis of purified recombinant human FAHD1 confirmed that it indeed exhibits ODx activity. Interestingly, the enzyme kinetics of FAHD1 closely resemble some of the values reported for an unidentified mammalian ODx in earlier years [4,3]. The mutation of key residues located within the catalytic domain, including a catalytic loop, resulted in abrogated or reduced enzymatic activity. As already observed in an earlier study , FAHD1 is located in mitochondria, showing highest expression in kidney and liver. Oxaloacetate levels in the kidneys and livers of FAHD1-/- mice were significantly increased in comparison to their wildtype littermates, thereby providing evidence for the in vivo relevance of FAHD1's ODx activity. Whereas currently no data are available concerning the metabolic role of the ODx FAHD1 in mammalian metabolism, the function of fahd-1, the nematode homolog of FAHD1 in C. elegans, has been experimentally addressed . Mutation of fahd-1 led to a series of deficiencies: reduced brood size, deregulation of the egg laying process and a pronounced locomotion deficit. Also, mitochondrial membrane potential and oxygen 3 consumption were found to be reduced in the fahd-1 mutant strain.Mutant worms grown at increased temperature showed an extended lifespan but no signs of an elevated mitochondrial unfolded protein response, different to worms with defects of the electron transport chain. These results clearly demonstrated involvement of fahd-1 in the maintenance of nematode mitochondrial function. Since homologs of FAHD1 are found in all eukaryotic species investigated so far, ranging from yeast to human, it can be expected that the enzyme plays an important and evolutionary conserved role for the maintenance of mitochondrial function, presumably by safeguarding against excessive accumulation of oxaloacetate to prevent the inhibition of mitochondrial respiratory chain enzymes. As an antagonist of pyruvate carboxylase, FAHD1 may also act as a gatekeeper for the entry of acetyl-CoA into the TCA cycle, and its deregulation may affect anaplerosis as well as the biosynthesis of TCA cycle-derived metabolites such as amino acids, neurotransmitters, and gluconeogenesis (Figure 1).It can be expected that studies with available FAHD1-/- mice  will shed light on the enigmatic role of the newly identified ODx FAHD1 and help to elucidate its functional interaction with other metabolic pathways. Fumarylacetoacetate hydrolase (FAH) domain-containing protein 1 (FAHD1) is found to play a key role in central metabolism, in particular at the intersection of catabolic pathways and the tricarboxylic acid cycle (TCA). Acting as an antagonist of pyruvate carboxylase (PC), it is involved in the regulation of the TCA cycle in general, as well as in the regulation of linked anabolic and catabolic pathways. TafernerA, Pircher H, Koziel R, von Grafenstein S, Baraldo G, et al. (2015) FAH domain containing protein 1 (FAHD-1) is required formitochondrial function and locomotion activity in C. elegans. PLoS One 10.